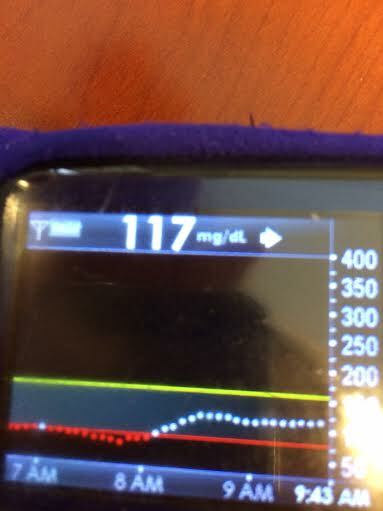 We recently reported a number of lessons from #DIYPS that have allowed us to greatly improve management of mealtime blood glucose in type 1 diabetes (n=1). One key component was measuring the rate at which carbs were absorbed into the bloodstream (in the absence of any prebolus or IOB), and tracking the carbohydrate decay over time. In order to effectively adapt these lessons from #DIYPS, it would be useful for others to do the same test. This post attempts to describe how to do so. This test is applicable to people with type 1 diabetes (with little or no natural insulin production) and requires the use of a continuous glucose monitor, such as the Dexcom G4. In order to eliminate as many variables as possible, it is important that no insulin is onboard (IOB) other than normal basal insulin. It is also important that nothing has been eaten recently, and that blood glucose levels are stable and in range. Since this test involves consuming carbohydrates without immediately bolusing for them, it is also useful if blood glucose levels are at the low end of normal range, ideally around 80 mg/dl. You can expect the test to take up to two hours, depending on the quantity of carbs consumed and the absorption rate. Once all these conditions are met, the actual test consists of consuming a premeasured quantity of carbohydrates (sugars or starches, without significant protein or fat), like a small juice box. In addition to measuring the rate at which carbs are absorbed, this test will also allow you to measure your carbohydrate to blood glucose ratio. In order to avoid raising blood sugars to unsafe levels, it is best to use 15 to 30 g of carbs, depending on your initial BG level and your carb to BG ratio. If you do not know your carb to BG ratio, it can be calculated using your carb to insulin ratio (meal bolus ratio) divided by your correction ratio. For example, if your meal bolus ratio is 10 g carbs per 1U insulin, and your correction ratio is 40 mg/dl per 1U insulin, then your carb to BG ratio is 10g carbs to 40 mg/dl of BG; or more simply 1 g carbs to 4 mg/dl of BG. In that case, if your initial BG level is 80 mg/dl, and you consume 20 g of carbs, you should expect your BG to rise 80 mg/dl, to 160 mg/dl, by the end of the test. By observing how high your BG actually rises, you can determine whether or not your ratios are accurate, and if necessary re-estimate your carb to BG ratio. Once the test is complete (or earlier, if you’re bored or impatient), you can note your initial carb absorption delay (the time required for glucose to get from your mouth to your CGM receiver), which is simply the time between when you ate the carbohydrates and the first significant uptick (generally more than 5 mg/dl in a 5 minute measurement interval). Then, once you start to see a sustained rise, you can calculate the rise rate. For example, if after 30 minutes from the start of the rise (~45 minutes from when you ate the carbs) you’ve risen 60 mg/dl, that would be a rise rate of 2 mg/dl/minute. If your carb to BG ratio is 1 g carbs to 4 mg/dl of BG, that would equate to 0.5 g carbs / minute, or 30 g carbs / hour. You may see that your carb absorption rate has an initial ramp-up period, and that it takes a few data points before BG begins rising steadily at ~10 mg/dl per data point (each data point is 5 minutes). Similarly, you may see that the BG rise flattens off gradually at the end. However, if your experience is like ours, you’ll see that for most of the time the carbs are being absorbed, the rise rate is fairly steady. For this reason, we find it useful to approximate the carb absorption curve by assuming an initial delay, where BG remains flat, followed by a linear rise at a constant rate (2mg/dl/min in Dana’s case), until all the carbs are absorbed and BG flattens out. Modeling carbohydrate absorption in that way allows you to fairly easily calculate how many carbs remain unabsorbed after a meal: simply subtract the initial carb absorption delay (~15m for Dana) and divide by the carb absorption rate (~2mg/dl/min) to see how many carbs are absorbed, and subtract that from the estimated meal carbs to get an idea of how much still remains to be absorbed. This, in turn, enables you to do a meal bolus calculation (as if you were just now eating the unabsorbed carbs) to determine whether your IOB is too high (while you still have time to do a zero temp basal) or too low (allowing you to safely administer an additional correction bolus even before your BG is done rising from the meal). #DIYPS uses this algorithm to repeatedly re-evaluate the remaining/active carbohydrates in the body and compare it to the IOB. Given that things can change quickly (especially with exercise/activity after a meal), the possibility of miscalculated carbohydrates ingested, or simply the body’s variable response to insulin, recalculating this repeatedly helps provide an additional safety net after meals. The simple self-test and calculations above should provide people with type 1 diabetes a method to approximate their own carb absorption rate and calculate carbs on board at any time after a meal. If you do perform this or a similar test and determine your carb absorption rate, it would be interesting and useful (especially in developing #DIYPS to be suitable for more widespread use) to compare results and see how carb absorption varies from person to person. If you are willing to share your results, please reach out to us to share (privately) whatever information you are comfortable sharing, such as carb absorption rate, carb to BG ratio, carb to insulin meal bolus ratio, and/or insulin to BG correction ratio. We will not share your individual data, but if we get enough responses, we will share aggregated statistics (average, median, standard deviation, etc.) so that people who have not done their own carb absorption test can still get a better idea of how fast their mealtime carbohydrates should be absorbed. Thanks for sharing your tips on here! I will certainly try and estimate my own carb absorption rate as soon as I get my hands on a CGM (most probably a DEXCOM).